As electric-vehicle charging infrastructure expands across Canada, so does the technology’s capability for innovative and sustainable solutions. E1 Transit is a Southern Ontario-based transportation company co-founded by entrepreneurs Han Yi and Christopher Misch, who is also co-founder and chief operating officer of Sun Country Highway, an EV-charging-station company. 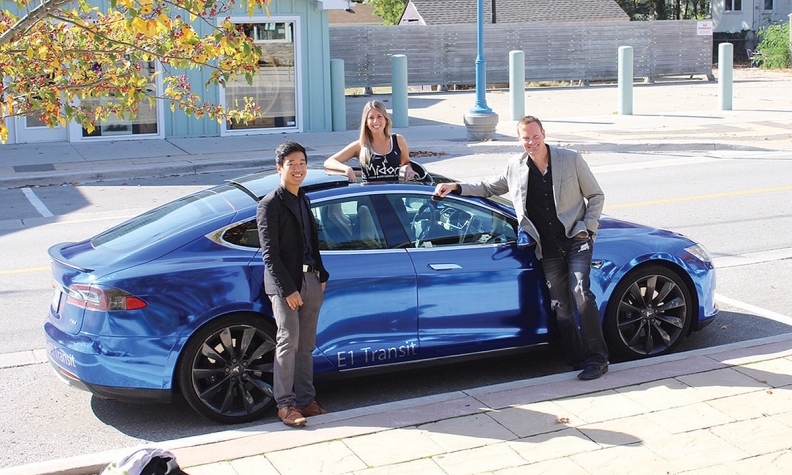 While the two organizations are functionally independent, E1 Transit uses the Sun Country Highway infrastructure net-work to charge its fleet of Tesla Model S sedans that transport customers to and from major airports in Toronto and Kitchener-Waterloo, Ont., and London, Ont., and areas within roughly a two-hour drive of those centres. Now in operation for six months, E1 Transit aims to provide a luxurious yet sustainable transportation alternative for travellers. “People want to get to the airport and they don’t want to pay for parking, they don’t want to deal with the traffic, and there’s also a lot of cost and time and headache with some of the scheduled services out there,” says Misch, E1 Transit’s chief sustainability officer. E1 Transit currently has three vehicles operating daily in the London area and will expand its fleet to 12 Model S sedans by spring. Another six to 10 cars are to be added over the following 12 months to expand service into every urban market in Ontario. The company’s longer-term goal is to serve every major Canadian airport and its vicinity within three years. Two aspects make the business model intriguing, Misch says. One is the company’s ability to make an average transportation service a more sustainable and pleasant undertaking for the customer. The other key feature of E1 Transit is its ability to extend mass-transportation services into rural markets. The company is currently exploring other viable urban markets for expansion, including Calgary, Greater Vancouver and Montréal, though Misch points out that securing the appropriate licensing has been a challenge and the company won’t invest in markets that present excess hurdles.